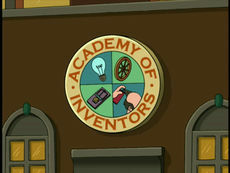 The Academy of Inventors is a group of super intelligent scientists that show their inventions at the Academy of Inventors Annual Symposium. The lowest mark any scientist has ever recieved was an A-Minus-Minus which was awarded to Professor Hubert J. Farnsworth for his Smell-O-Scope. This page was last edited on 13 August 2013, at 19:08.